thiruvAimozhi – 7.8 – mAyA! vAmananE! AzhwAr meditated upon these aspects and questioned emperumAn who is seen by his intelligence “How are you, with such aspects, having amazing ability to have the universe which is having such contradictory aspects, as your wealth?” and becomes satisfied thinking that he has nothing to do in eliminating his own hurdles. In the previous decad – AzhwAr experienced uruvuveLippAdu (visualisation) in previous decad; as he could not reach out to emperumAn, he understood it to be mere visualisation. Now, he also understands that sarvESvaran will keep him in this material realm until emperumAn accomplishes the desire task; yet, as he cannot sustain himself without emperumAn, he will not remain patient thinking about this aspect. Even if AzhwAr prays to emperumAn saying “please eliminate my hurdles”, he will not fulfil that until AzhwAr completes his prabandham. Though he does not fulfil AzhwAr’s desire, emperumAn knows how to sustain him in this material realm. Hence, as some entities [fish etc] are sustained by keeping them together with water, AzhwAr too is sustained so that he never perishes nor lives happily and is tormented; meditating upon this, he says to emperumAn “though I don’t fit in this material realm, you are keeping me here and making me live; kindly explain to me this amazing act of yours”; as those who would divert others when a particular question is asked by answering in an unrelated manner, emperumAn said “Are you amazed by this one aspect? You now behold my variegated universal form!” and manifested his amazing universal form – though AzhwAr did not expect to see that, since it was shown by emperumAn himself, it will be pleasing for AzhwAr. Hence, as AzhwAr asked one question, emperumAn manifested many amazing aspects and satisfied him. akrUra, on the banks of yamunA, stepped in to the river and saw the children (krishNa and balarAma) inside the river as well and being fearful looked out; he saw them there as well; seeing them there, he said as in SrIvishNu purANam 5.19.7 “jagath Ethath mahAScharyam rUpam yasya mahAthmana: | thEnAScharya varENAham bhavathA krishNa sangatha: ||” (Oh krishNa! I united with you who are having amazing activities and with you, the mahAthmA (great soul) who are having this amazing universe as your form) and became amazed; AzhwAr too becomes amazed seeing his variegated universal form. 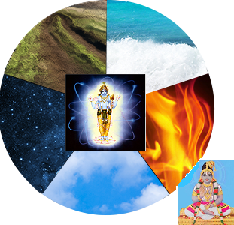 This entry was posted in thiruvAimozhi, thiruvAimozhi 7th centum on October 18, 2018 by Sarathy Thothathri.